Get the look and the protection you deserve with Desperado safety glasses from Crews. The Desperado's single lens design provides two distinct optical centers and provides powerful protection even in the most challenging circumstances. 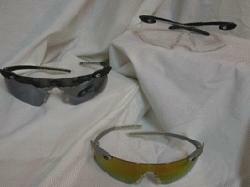 The frameless "floating lens" design provides maximum coverage with the lightest weight possible. With 20 unique color and lens tint options to choose from, this will be the only Desperado you'll want to keep with you. . . at work or play.